Whether you are looking for a romantic getaway in a quiet, private location; a family vacation near Pigeon Forge, Gatlinburg, and The Great Smoky Mountains National Park; or a Motorcycle tour of the Smokies: Tennessee Rose is the perfect Log Cabin for you. Only three miles from the cabin is the Beautiful Foothills Parkway. As of November 10th 2018 this newly completed western section is open to the public. It begins in Wears Valley, very near to the cabin, and extends to Chilhowee a 33 mile unforgettable drive. Here you will see some of the most Spectacular Views anywhere. See our photos we took opening day. Free use of Outdoor Pool, Pavilion, and Catch and Release Fishing Pond. Our cabin, located in Beautiful Wears Valley, is only minutes away from Pigeon Forge, Gatlinburg and The Great Smoky Mountains National Park. The Foothills Parkway, 'Deals Gap / The Dragons Tail', The Cherohala Skyway, and The Blueridge Parkway are all nearby. 'Tennessee Rose' has all the amenities you need to enjoy a quiet peaceful stay in the mountains. Close to all the area attractions yet very private. Home Theater room with 8 ft screen, We recently added a DVD/ Blu Ray player that has a WiFi connection so you can access your NetFlix or YouTube accounts. This room doubles as a game room with pool table, Wireless Internet, and garage for your automobile or Motorcycles. 'Tennessee Rose' is owner built, managed, and cleaned, so you can be assured of a very clean, well maintained cabin at a reasonable price. All roads leading to the cabin are paved with none being steep or winding. We absolutely love this area and The Great Smoky Mountains National Park. We now live and work in the Pigeon Forge area. 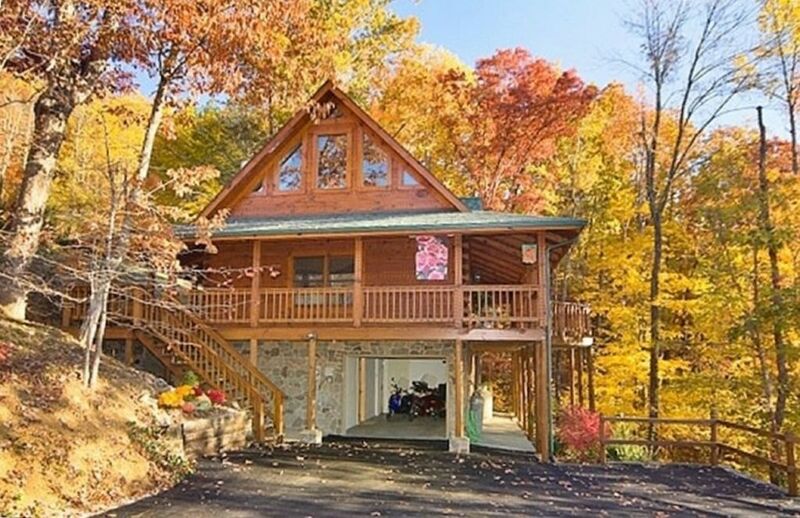 We chose the Wears Valley area to built our dream cabin because of it's great location to the Smoky Mountains National Park, Cove Mountain, and all the Pigeon Forge and Gatlinburg area attractions. We built this cabin ourselves and lived in it for several years before putting it on a vacation rental. Having done this we can honestly say it is a very peaceful and quiet location. We really enjoyed the cabin. It was beautiful. The location is awesome. It is private but not too secluded that it's "creepy"
The book with the history of the building process was very neat, thanks for sharing your journey and home with us. The place was very clean and well stocked. Usually the most dreaded part of the trip to the area (Gatlinburg, Pigeon Forge, Sevierville) is the lodging. There are usually too many people and no privacy but not any more. Easy to get to. Everything was fantastic. I highly recommended this cabin. Peaceful, clean cabin. We had a wonderful stay. We plan on returning. Owners are very easy to work with. The cabin was amazing. It was close enough to easily day trip Pigeon forge/Gatlinburg/Smoky Mtn. It was located in a peaceful area with nice mountain view from the deck. Highly recommend staying here, owners are awesome. Such a beautiful cabin and area to get away from the hustle and bustle of everyday life. Nice and quiet but your only a few miles from town. I will definitely return in the future. As stated the cabin was very clean and all needed items were available. The owners were very easy to work with and the communications between us via text/email was very pleasant. I would definitely stay again.